In two separate studies, beet juice and beet root fortified bread both helped lower blood pressure in men over a 24 hour period. Beets are a naturally nitrate-rich food along with other vegetables such as spinach and lettuces. Nitrates can be converted into nitric oxide in the body. Nitric oxide helps keep blood vessel arteries from getting stiff and sticky and increases blood flow. 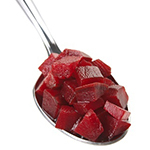 Consumption of the red beet juice and bread resulted in higher urinary nitrate excretion. Researchers suggested that eating nitrate-rich vegetables could help lower blood pressure.